Everything was fine today no matter what happened. 15 Days Until Tom Comes Home!!!! We headed out this morning ready to explore Tampa Bay. The first thing we needed was fuel. Rog had scoped out the station and we were all set. Well not so much, the driveway into the place was trickier than it looked. It was a tight turn, a steep slope up and a dip (the gutter) in the beginning. Well we started up and the rig started rocking and rolling. I am sure when I looked back as we hit the mess I saw the slide-out tip out at the top by 4 to 6 inches. I thought things were anchored down good inside, but a lot of things shifted and some went flying. The microwave glass dish came out and broke into many pieces and I had a bowl of fruit that landed on the floor with the broken glass. In that bowl of fruit were two avocados that are now guacamole in a hard shell. LOL Also the cupboard above the sink opened and stuff was every where and one of the flowers in the blue pots came down and broke. I have had those for seven years. One down and two to go. LOL The next shocker was the amount and price of fuel. LOL Hold your nose and just pay. We had a great trip here and it appears that slide-out is in great shape too. We moved to Palmetto, Florida, about 80 miles down the road. We are almost on the beach. This is a very nice park. The pool and rec hall are small, but the people are so nice and helpful. This is an ad is for a flying school. Then we traveled by world's of the past. There was a herd of these chasing each other around one of the buildings. Ads for an RV sales lot. Like the art of the cars in the desertTexas somewhere. A 1957 Airstream, a 1963 mini, known as the Bambi model. But the rest are from a scrap yard up in North Florida. 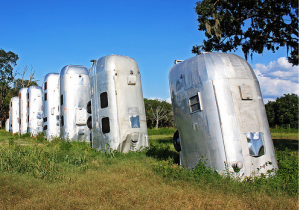 Each RV stands for a decade the Airstream’s been around. They just celebrated their 75th anniversary. The ‘63 Bambi stands for the half decade." Airstream trailers were placed here in 2007 and the legal battle began in 2008 all was settled and they could stay. Breaking news, another law suit was filed in 2010 not sure how that turned out. Last suit he had to pay $100 a day fine if he left them up. Not sure if he has won his case again or if he is paying the fine. Cadillac Ranch in Amarillo, Texas. It was created in 1974 by Chip Lord, Hudson Marquez and Doug Michels, who were a part of the art group Ant Farm. This is Texas so no law suit, my property I get to do with as I wish. I guess that's how it works there. I love this tree. Royal poinciana is a flamboyant tree in flower, some say the world's most colorful tree. For several weeks it is covered with exuberant clusters of flamed-red flowers 4 to 5 inches across. Royal poinciana gets 30-40 ft tall, but its elegant wide-spreading umbrella-like canopy can be wider than its height. Royal poinciana is deciduous in climates that have a marked dry season, but in Florida and other areas where the winter is not that much dryer than the summer, it is a semi-evergreen tree.